The Hogs will compete in 11 events total, with two diving events, three relays, and six individual swimming events on deck for the program. 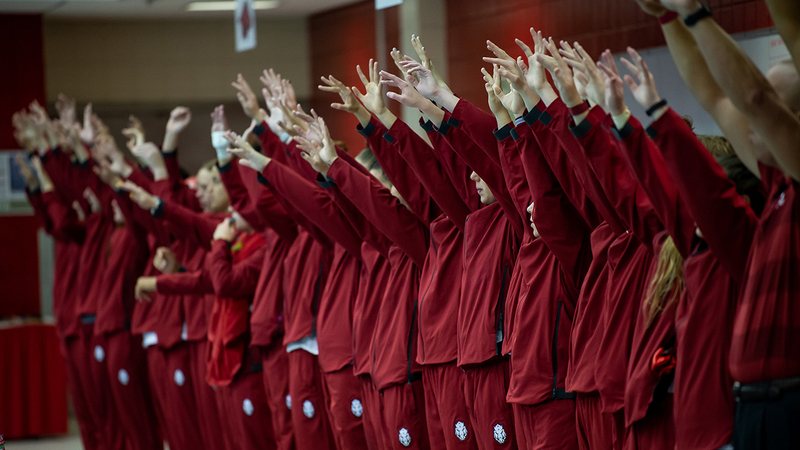 This will be the first year since 2015 that more than four student-athletes will be competing at the NCAA Championships, as well as the first time since 2015 that the Hogs will compete in a relay event. Junior Anna Hopkin and sophomores Peyton Palsha and Brooke Schultz were invited to compete in individual events, while Kobie Melton, Sydney Angell, Marlena Pigliacampi, and Molly Moore will round out the relay teams. Palsha and Schultz are championship veterans, with Palsha once again competing in the 1650 and 500 yard freestyles while Schultz will look to defend her 3-meter national title. Hopkin holds five individual records as well as two top-10 NCAA times. She was part of three relay teams to set school records at the SEC Championships, with Angell, Melton, Pigliamcampi, and Moore also part of the record-setting relay teams. Schultz holds three Arkansas records on the springboards and was crowned the SEC Champion in the 1- and 3-meter last month for the second consecutive year. At last year’s NCAA Championships, Schultz was just 0.35 points from qualifying for the 1-meter finals and earned a first-place finish in the consolation round of the event. The Razorbacks will begin competition at Texas Thursday morning, concluding the meet Saturday night. Swimming preliminaries will begin at 9 a.m. daily, while the finals will begin at 5 p.m. Diving preliminaries will begin at 11:30 a.m. on Thursday and Friday. ESPN will broadcast live coverage for both Friday and Saturday finals on ESPNU, as well as streamed coverage on ESPN3 for Wednesday and Thursday evening finals. All sessions not part of ESPN’s broadcasts will be streamed live at https://texassports.com/.